Some great new art books! Small book, big impact, are the four words that encompass Jim Houser’s latest offering. This is one of the most personal artist monographs that I have seen in a long time. 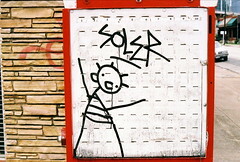 Interviews and photo collages, capturing moments of Houser’s life and work, give a great deal of insight to the artist. The letter at the end about his late wife, Rebecca Westcott, was the most touching and hopeful thing I have read in a long time. This is as authentic as it gets. You can pick this one up on our site or come by the gallery. BLK/MRKT Gallery teamed up with publishers Die Gestalten, to issue ONE, a 208 page, full color, hard bound book commemorating the gallery’s first artist annual. This volume contains work from over 30 artists including, Dave Kinsey, Tiffany Bozic, Jeff Soto, Brendan Monroe, Doze, WK Interact, Rich Jacobs, Jose Parla, Bask, Tes One, Maya Hayuk and many more. The Foreword, written by Gallery owners Dave Kinsey and Jana DesForges, offers an insightful perspective on the art movement and the artists featured in the annual. For a complete roster of artists and to purchase the book ($45 U.S.), visit the gallery’s website. Posted in Art | Comments Off on Some great new art books! I just found the Deep Ellum Photo Pool on Flickr, and am excited to spread the word. It’s a great way to see how other locals see the neighborhood I now call my home/workplace. It’s also great to be able to read and make comments on each of the photos. Got photos of Deep Ellum? Join up and share. 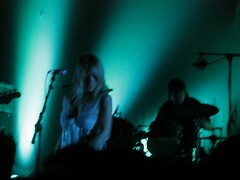 Sonic Youth at the Gypsy Tea Room was amazing. I was half expecting this concert to possibly be a let down after hearing by a few friends that a recent appearance on one of the evening late shows wasn’t all that great. But as the first song got underway, it was apparent that my friends who opted to pass on their tickets because of that late show were going to be missing out. The show was amazing. Kim Gordan, who is in her 50’s, is still rocking like it’s 1999! Twas a night to remember. Glad my friend had a digital camera with him. He posted a few shots on his Flickr page. 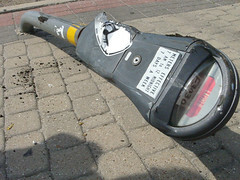 I also practically stumbled over this meter today in Deep Ellum, and luckilly I had a camera with me. Hope this is a sign of good thing to come here, since last I heard there has been rumors of a city ordinance about to pass that will allow FREE parking at meters in Deep Ellum during the day till 6pm. Word on the street is that it has passed, but I haven’t seen anything yet. Must be a lot of red tape that is getting sorted out. 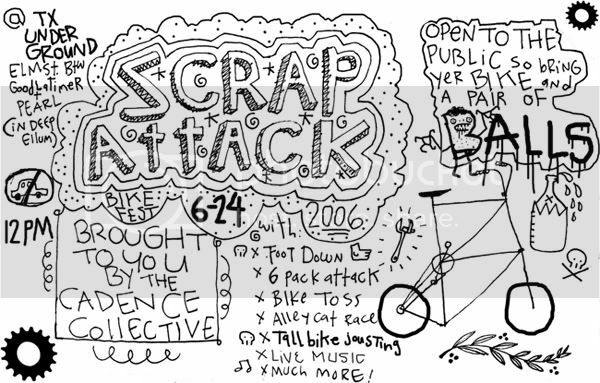 I can’t wait for the Scrap Attack. Bikes and good times. Come one come all for some Saturday fun times…then Sonic Youth later at the Gypsy Tea Room…whaaaa…who says there aint nothing to do in Dallas!? Sounds like a great Saturday to me. You got the design district gaunlet tonight (Friday) with Conduit Gallery, Marty Walker, Craighead Green, and maybe Holly Johnson — they usually have an opening the same night but their website isn’t up to date and I don’t feel like calling. And maybe the fun-factor highlight is Martin Coyne’s (Wayne’s wife) pictures of the Flaming Lips at Conduit (see image above). Then Saturday you got Patternage curated by Mary Benedicto at the Continental Lofts as part of the Pigeon Stone Project. Their website is also out of date, but I’m being more generous at seeking out the info since I’ve got a piece in this show. It’s 7pm-10pm and they’ll have free beer, I believe. Tyler Green posted a list today of the Dallas Museum of Art‘s 2005 acquisitions. I’d kinda like to see Ant Farm’s Media Burn pictured here, a ’59 Caddy driving through a wall of flaming televisions. Looks like we have a new artist residency program forming in Dallas called La Reunion. Good to have something new after the demise of the UTD/Southside residency. Speaking of residencies, Artpace is now taking submissions for 2008. Might be worth a shot — they occasionally choose somebody outside San Antonio. Dallas and around the world. American, Southwest, Love Field, and DFW have finally come to an agreement, and they are going to propose a full repeal of the Wright Amendment to the Texas house, with the stipulation that Love Field reduce it’s operating gates from 32 to 20, and there will be no international flights. Still not sure if that eliminates flying to, say, Newark or O’Hare and then on to Europe or if that will be restricted as well. But anyway, we’ll finally have cheaper domestic flights and a closer airport if this passes, awesome. This is the last week for our Roy Stanfield + Wendy Red Star show at And/Or Gallery. Come out Saturday between noon and 6 (or email and make and appointment) and check it out if you haven’t yet. See Tom Moody’s writeup here, and it’s also been posted on LA’s Flog. Private Club is a series of recent works by Dallas artist Benjamin Hancock in collaboration with Super Conscious Art Collective. Mixed media varies throughout the show including acrylic, oil, transfers, and etchings on wood in sizes ranging from 1 to 4 feet. Private Club is a celebration of elite society and popular culture. The subject matter consists of recreational rituals, award ceremonies, and preparatory school. Minimal silhouetted images are elegantly displayed on rare wood inlays. Balanced with modern heraldic crests silk screened and laser etched onto fine wood. Layers of chichi pop culture icons like graffiti and eighties graphics contrasted with intricate old European designs give the work a unique appeal. Come out and see the work; a 30% donation of all purchases will be made to the numerous Dallas charities. Complimentary valet, d’oeuvres and wine will be provided to patrons.